Product prices and availability are accurate as of 2019-04-10 17:09:08 EDT and are subject to change. Any price and availability information displayed on http://www.amazon.com/ at the time of purchase will apply to the purchase of this product. This is a complete made in USA Cabinet Gun Kit made to replace the operating system of most imported sandblasting cabinets on legs. It gives you the benefit of USA blasting technology at an economical price. It also provides continual and immediate availability of nozzles and wear items as needed. Includes clear instructions and installs in minutes with simple hand tools. In addition, our complete catalog is included for future availability of parts and nozzles. INSTALLATION IS EASY! - Simply replace the imported cabinet gun, siphon hose and pickup tube of imported cabinet with those of Skat Blast Upgrade Kit. Complete, easy-to-follow instructions included. 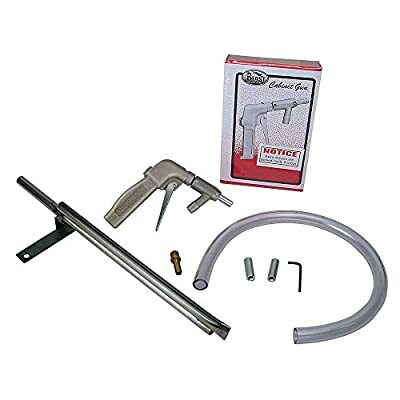 The gun in this kit includes a medium air jet and nozzles for use with most 5 HP air compressors.